Celebrating the 20th anniversary of their classic album Roots, brothers Max and Iggor Cavalera continue their tour on Valentine’s Day night in Dallas, Texas. 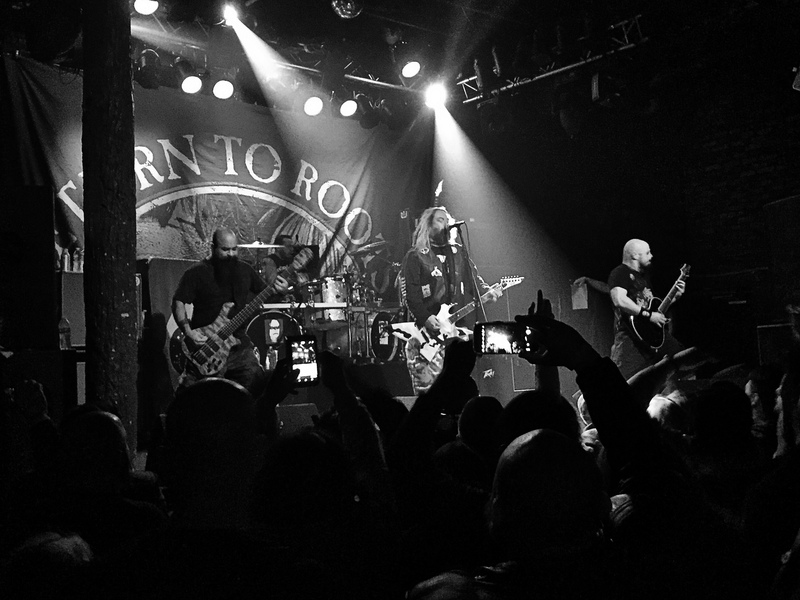 Joined by the razor-sharp guitar playing of Marc Rizzo (Soulfly, Cavalera Conspiracy) and the always reliable Tony Campos (Fear Factory, Ministry, Prong) on bass, the brothers from Brazil played the album in its entirety to a highly receptive and motivated crowd. Indeed, I haven’t seen so much singing along (to nearly every damn song) at a gig in a long time. Right off the bat, the crowd was singing along to the album’s opening cut, “Roots Bloody Roots,” and it continued enthusiastically throughout “Cut-Throat,” “Attitude,” and even “Ratamahatta.” Cavalera, ever the frontman, encouraged chants of “Aye!” and “Oi!” from the always accommodating crowd. In fact, the crowd was locked-in as much as the band. Like the audience, Rizzo and Campos sang along to the songs and frequently provoked the crowd with fist-pumps. Meanwhile, Iggor Cavalera not-so-quietly held it all together with his fluid percussion. “Itsari” was Iggor’s moment to shine as the he was left alone onstage (playing along to a backing track) to perform the drum-driven song. Of course, that was hardly the only song that highlighted his drumming. “Breed Apart,” “Straighthate,” and “Dusted” all rely upon his percussive backbone. Max & Iggor Cavalera, Trees, Dallas, TX. Photo by J. Kevin Lynch 2017. The Roots set closed with “Ambush” and “Endangered Species,” about the time I realized that most of the album tracks clock-in at less than five minutes. Needless to say, the set flew by rather quickly. The encore featured covers of Celtic Frost’s “Procreation of the Wicked,” Motorhead’s “Ace of Spades,” and a sped-up reprise of the album/set opener “Roots Bloody Roots.” Crammed in there was a medley of a few Sepultura classics played by the Cavalera brothers alone. Bassist Campos and guitarist Rizzo took a break during this segment, which was a little odd. Honestly, I would’ve loved to have heard some full-band Sepultura classics from Arise or Chaos A.D. If you’re a longtime fan of the Roots album, you’ll surely love this retrospective tour. The Cavalera brothers look like they’re having a great time revisiting this material. Prior to this North American tour, the band toured extensively in 2016. Consequently, they’re locked-in and the live tracks are flawless when put up against their recorded versions. Most importantly, the enthusiasm the band brings to the set is infectious and makes for a hell of a good time.